Listing: Grade II*. Mid C16 with possible earlier origins, restored 1930s. Close studded framing. Inside: fine Jacobean moulded plaster ceiling and carved C16 overmantel. 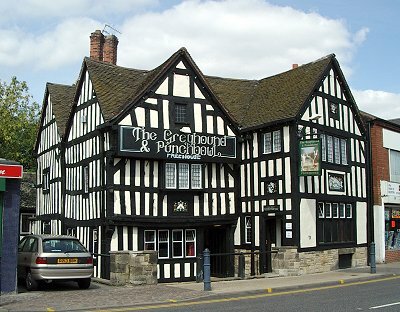 Pevsner: timber-framed with closely set uprights, i.e. c.1450 or so. Two gables not in line. 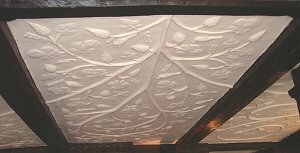 Inside, a nice Jacobean plaster ceiling with thin leaf scrolls. Comment: The Black Country is not usually associated with half timbered buildings but there are a number of outstanding examples in this city (not to mention one of the greatest mock Tudor houses at Wightwick) and two next door in West Bromwich. The Greyhound is splendid inside as well as out. It probably rates only 2* because of quite heavy restoration. 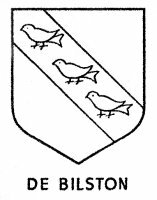 Bilston, in the days when it was very much a country village with only incipient industry, was the residence of many members of the gentry. This building is one of the oldest and most important of them and almost the only survivor, Pipe Hall being the other. 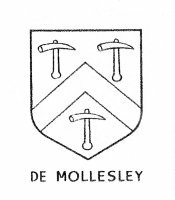 According to Mills and Lawley it was built about 1450 by John de Mollesley and was originally called Stowheath Manor. They say it "would have been divided into three blocks: the west wing containing the principal living room, the east wing the kitchen area and a hall which connected the two". 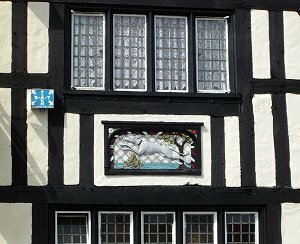 Lawley's History of Bilston says: "The residence of [the Moseley family] in Bilston was the old half timbered house in High Street, now known as 'The Greyhound Inn', a building of early Tudor architecture, dating from the latter end of the 15th century. When the Commissioners of Henry VIII came to Bilston to enquire into the state of St. Leonard's church, they stayed at this house. The house was sold during the Civil War to John Green, Gent, whose son was a Captain of Cavalry in the Royal Army and fought in the battle of Worcester, in which he was slain". The house gradually came down in the world, probably as industry in the area increased and the country gentry retreated. At some time, possibly around 1810, it became an inn. By 1936 the building was in an advanced state of decay but was rescued by the brewers, W. Butler & Co., who bought the place and restored it. 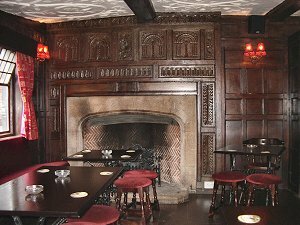 It continued successfully as a pub for some decades but again fell on hard times and by the end of the 20th century had periods when it was not tenanted. Butlers (now Mitchells and Butlers) sold it to a pub chain. In 2002 English Heritage put it on their list of buildings at risk, alleging that it had structural problems and seeking a full survey. They and the city council offered to contribute to the costs but the current owners, Avebury Taverns, did not agree that there were problems warranting the expense. In 2002/3 they refurbished the building and it is now open again in what, from external appearances, seems to be pristine condition. This photo shows the close studding on the font of the building and also a plasterwork panel of a greyhound. The date and provenance of this panel are not known. 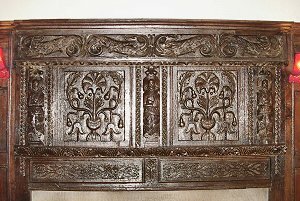 This panel shows the punchbowl. 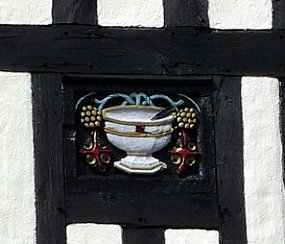 Again the provenance is unknown but both panels, which probably count as pargetting, are nice period features. The central passageway with the bar to the right. The roughly shaped column on the left is popularly supposed to be a tree that was growing on the site and which was used, whilst still living, as part of the building. 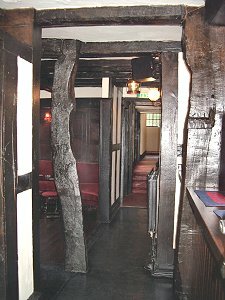 No dendrochronological tests are known to have been carried out on this building but this post, and that by the bar to the right, may have been cut out of trees that were felled on the site or, at least, locally. The main lounge with its carved overmantel and plasterwork ceiling. A close up of the ceiling. A close up of the overmantel above the fireplace in the front room.